Startup Yagalet represents the project of transport of the future - a flying car from Russia. 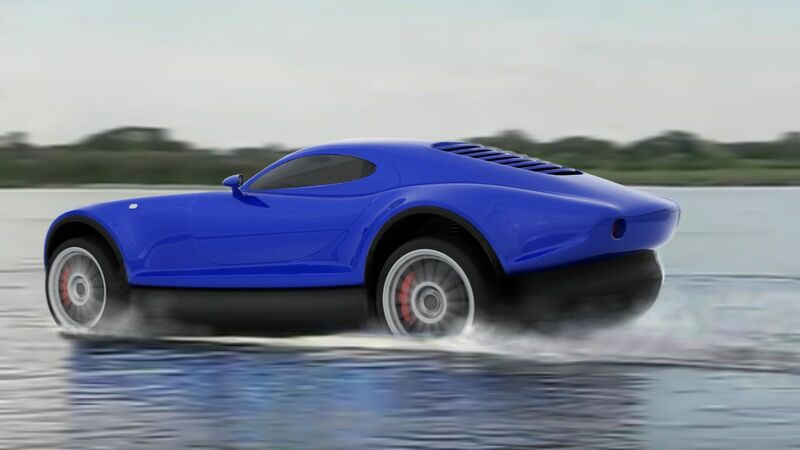 A consortium of Russian enterprises and specialists led by a designer from Russia in the Samara Region Vitaly Ivanov is developing a sports car, with the integrated functionality of a hovercraft. The effect of aerostatic unloading will allow YAGALET® Prototype 2.0 to move with the usual speeds for road transport over any other surface - the height of the flight is limited by the height of the flexible shield made of polymeric materials (folding into the lower part of the hull) and the air gap (from the released air masses formed by the injection unit). But the most important side of the technology of the hovercraft involves movement over water and thin ice, viscous swamps and deep snow- which is not available for any other vehicles. The main advantage of a car with the function of low flight - hovering over the ground. It is a safe movement which does not require the pilot to have a special piloting skills, therefore, no flight license will be needed. An additional advantage of a new type of vehicles is the possibility of using them in the big cities along waterways and canals - bypassing traffic congestions. In general, the possibility of using the built-in mechanism that allows movement above any earth surface, at any time, at the will of the pilot only by pressing a button or moving the lever is an important advantage in comparison with all other vehicles that require delivery or direct placement in the places of preferred use. Perhaps, we are talking about creating a new category of vehicles, and in the future it will be surprising for everyone that cars once used to go only on wheels. Just recently, experts predicted that crossovers will occupy a small niche in the production range due to the high cost of acquisition and operation, but now this is one of the biggest segments of the automotive market, and automakers are systematically getting rid of compact cars in their model lines. The startup provides for the development of a model range. It is planned to create a flying SUV, a flying minivan and even a flying house. A biggest step in the evolution of vehicles will be adaptation of the screen flight - the flight of wheeled hovercraft cars at altitudes from one to several meters above the surface, whether it is loaded roads or water surface. Which is also an advantage, since for the control no flying license and additional navigation equipment is required. Technical details of the project, project participants and other details will be presented later. At the moment, completed the layout design, constructive and layout development. The idea of the project originated in 2010 and was originally in the concept of a flying motorcycle. Later, it evolved into a four-wheeled vehicle - a compact open Prototype 1.0. Then, in the course of work to increase the bearing capacity of the pillow, it turned in to full-size closed (with increasing stiffness and weight reduction) Prototype 2.0. The only example of similar development (howercraft with the ability to move on wheels on public roads) can be specified only one project in the world - the Russian experimental flying car GAZ-16 of 1960-64, and possibly"Object 760" - a flying tank of the same years of development. The project is conducted at the own expense of the developers and now is ready to consider proposals for external co-financing.